One is never happy to receive notices from the government in the mail, but Robert Bender had the dour duty of delivering his own draft notice from Uncle Sam! As a postman in Mechanicsburg, his notice told him he had been drafted into the US Army. 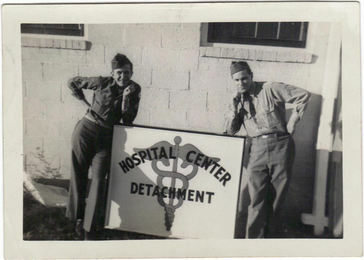 Bob, as he is known to his friends, passed his physical exam and received another notice, this time from the President, welcoming him to the military. 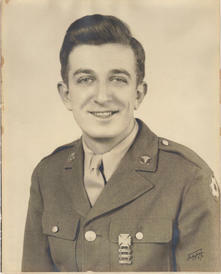 Bob reported for duty on August 15, 1944, his first assignment being Camp Barkley, Texas (now Fort Hood.) 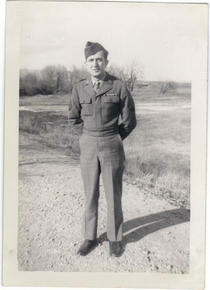 Bob received 8 weeks of basic infantry training along with basic medical, file and mail clerk training. The Army used live ammo for practice in the infantry training, so “you had to stay low and keep your head down.” They also learned what to do if you were victim to mustard gas. 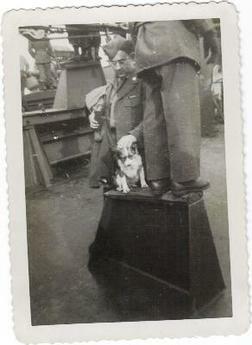 Bob was also sent to Fort Carson postal school. While at Fort (Camp) Carson, Bob remembers having guard duty in the early hours. You had to say, “Halt, who goes there? Come forward and be recognized!”, to anyone who came around. And you had to be carrying your rifle, not your “gun” If you called it a gun; you had to sleep with it for a while!! There was also KP duty, usually around 4:00 am. The main responsibility for Private Bender, however, was delivering the registered and insured mail for the Camp Carson hospital and patients. Those patients were wounded men who were recovering from battle wounds and many had frost bitten feet. The mail was very important to them as they were trying to mend and figure out how to rebuild their lives. It may not sound so important to you and me, but to those men, a letter from home, be it mother or girlfriend, was an important life line back to reality. Bob remembers how happy they were when he came around each day. Near the end of the war Bob was sent to California for duty. From there he accompanied a “Banana Boat” the Elizabeth C. Stanton, to Liverpool, England. The cargo was German prisoners of war being sent to England to work in the coal mines. Bob remembers having to wear a “Mae West “ belt, an inflatable device in case the ship sank. This was important to him, because he could not swim and was very worried about having to jump into the sea! They slept on canvas hammocks hung from the rafters! The ship sailed through the Panama Canal in 120 degree heat. They docked at Liverpool, England after passing the white cliffs of Dover on the way. 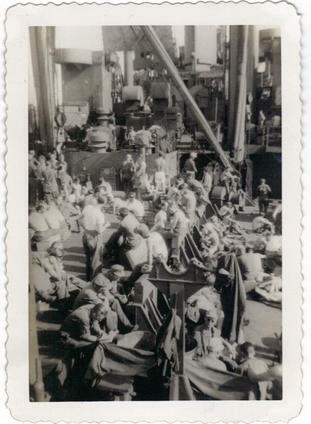 While in England, the troops did not disembark the ship but stayed onboard for a quick departure to France. From there they departed for home, a trip which took another 30 days on the water. Bob returned to the US and was sent to Fort Georg Mead, in Maryland from which he obtained his separation papers in July, 1946, having earned the Good Conduct medal, the American Theatre, and WWII Victory ribbon. Bob also achieved the Sharp Shooters Badge. The best part of being in the Army was seeing the Statue of Liberty in New York Harbor on the last trip home from France. Six months after his return to civilian life, Bob was called by the Post Office in Mechanicsburg, where he worked for the next 34 years. He married Freda K. Shearer in 1948 and raised a son right here on Broad Street. Bob was active in his church and community his whole life. He was past Commander of the American Legion (1958) , Citizens Fire Company (72 years), Community Development of Mechanicsburg (President) and the Simpson Library. You have to get along; especially with people you don’t know very well. You have to listen and do what they tell you and go where they tell you. Mr. Bender died on 20 April 2014.